Part of living along the coast is knowing the risks involved during Hurricane Season. We know you're preparing for Hurricane Florence right now and we wanted to offer some tips to keep you focused on what matters during your preparations! First and foremost... focus on the safety of you and your family. We are encouraging you to remember that friends, family and pets are always top priority during times like these. That being said, take the time to talk about your Hurricane safety plan with your friends and family. Make sure your loved ones feel comfortable with your safety measures that are in place and talk about evacuating whether it's mandatory or not and make the best choice for your well-being. A house is important, but a house can also be rebuilt. Should you choose to stick it out, we want to offer some tips that will ensure the best case scenarios for protecting your loved ones, pets and your belongings! 1. Are you located in a flood zone? 2. Do you know your best route for evacuation, if necessary? 4. Do you have pets and a plan of action for including pets in your preparations? 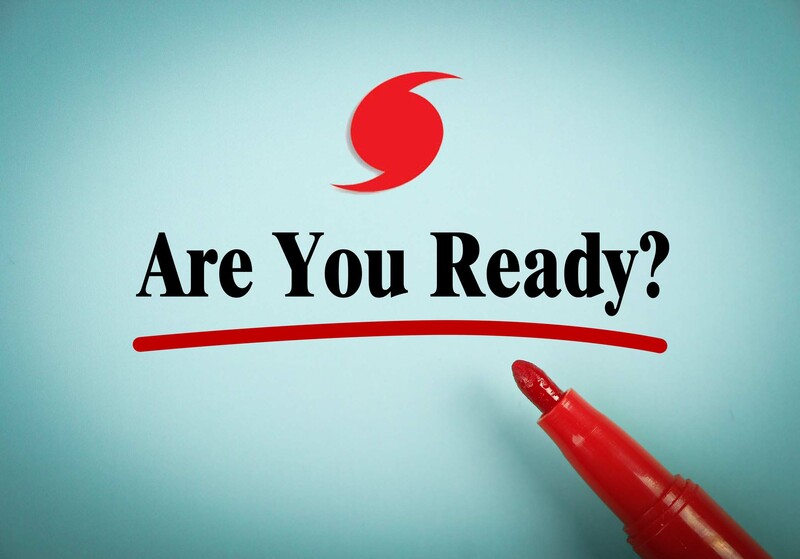 Once you've answered these questions you'll be able to tell how much work you have to do to get yourself ready for the storm and a possible evacuation plan. Now, let's talk about some of the supplies you'll need to have at home if an evacuation is not necessary. It's always good to have a first aid kit or common medical supplies handy just in case, but in addition to that, you should stock up on batteries for flashlights, radios and anything else you may need that requires batteries, candles or lanterns in case the power goes out, matches, prescription medications, your ID cards, plenty of food, gas in the cars, and water. It is a good idea to have 1 Gallon of water per person for 3 days and a food supply of non perishable items, along with a manual can opener. If you have pets and you're forced to evacuate the area, be sure to have food and water for them as well. When it comes to your home, there are several things you should do to prepare that will go a long way in protecting your home, your belongings and save you time after the storm when you start to clean up. 1. Debris: clear away any debris or loose items like lawn furniture, flower pots, yard decor and garbage bins that might get blown around and possibly blown into your home's exterior with strong winds. Try to remove any dead branches from trees or shrubs ahead of time since they are usually the weakest and first to fly off in heavy winds. 2. Boarding: Board up your windows so that they stay protected from loose debris. If you cannot board them, use industrial strength tape to prevent shattering by placing a large (x) pattern in tape across each window frame, and place sandbags in front of doors or any openings that may be flooded. 3. Drainage: Secure your roofing and clean out any debris from gutters well before the storm hits. Making sure your gutters are clean will go a long way in preventing water from building up in and around your home. Creating a flow line for water to spread properly is the best way to prevent flooding. Now let's go inside of your home and prepare your living areas. 1. Light Sources: Charge all devices that provide a light source, such as lap tops, tablets, cameras, and old phones. If you lose power, you'll have charged light sources and old cell phones can still be used to dial 911. Be sure to charge cell phones and external battery back ups. Be sure to purchase batteries for flashlights, radios, etc. and have candles/matches as a back up just in case. 2. Kitchen: Clean out the refrigerator and freezer by throwing out any perishable items that won't survive a power outage. Turn the fridge to Max Cold setting and try not to open it often. Keeping it as cold as possible will lengthen your cooling time in the event that the power goes out. 3. Water Supply: Fill your bathtubs, washing machine and sinks with water so that you'll have a supply during and after the storm if water is not available. It's also a good idea to stock up on containers of water such as your previous mentioned "per person" water supplies. You can also freeze zip lock bags full of water which will help keep the inside colder if power loss occurs and also provide you with drinking water once it thaws out. If you're planning on evacuating, freeze a container of water and sit a penny on the open top of it. If you return and the penny has dropped to the bottom, you'll know that your freezer reached thawing temperatures and you'll need to get rid of food storage that is not longer safe. Tarps: in the event that flying debris damages your home, roofing materials are torn off of your home, or you have windows that get damaged it's always a good idea to have a few tarps available in order to temporarily keep those areas covered and dry, if at all possible. Insurance Information: before a projected storm hits, make copies of your insurance information and put them either in your evacuation kit or somewhere safe if you're sticking out the storm. Just in case of damage, it's a good idea to have these copies handy afterwards. A generator: If you have access to a generator, it's probably a good idea! If you lose power for any amount of time during and after the storm, a generator will become your best friend! Don't forget to have extra gas handy! Please remember to always follow local government instructions when it comes to keeping you and your family safe during a Hurricane! While you're preparing, please think about all of your options thoroughly. Again, a house can be repaired and even rebuilt, but the lives of you and your family are simply irreplaceable.